A lovely little walk on a frosty winter’s morning across Studley Royal Park before returning via the Seven Bridges. Going to Fountains Abbey and Studley Royal Park are some of the earliest memories I have of family days out. I have always enjoyed going back and so when my wife suggested we go and see the deer and walk back along the Seven Bridges I thought it was an excellent idea. Although we could have parked at the car park above Studley Lake there is a charge to do so. Instead we went for the free parking option at the large car park next to the Fountains Abbey visitor centre. This meant adding an extra half mile or so to the walk but as it was a fairly short outing it was no big deal to do so. From the car park we followed the path around the outside of the park to reach a gate giving access to the top of the estate alongside the obelisk and the superb St. Mary’s Church. Consecrated in 1878, St. Mary’s Church was designed by the architect William Burges and is a masterpiece of the Victorian era Gothic revival. Equally impressive, just beyond the church, is the chorister’s house. While my wife and daughter carried on down the main drive I detoured left on a wide grassy path towards the deer herds that I could see grazing. 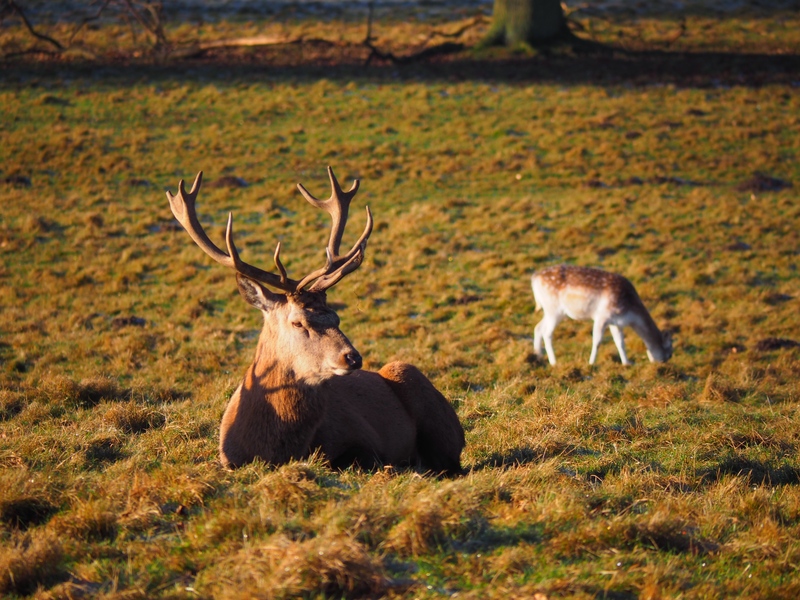 Studley Royal Park contains over 300 deer of three types, Red deer, Sika deer and Fallow deer. From a distance I’m never too sure about the difference between Red and Sika deer but of the two I would say the former are in the majority. After first getting close to take some pictures of the Red deer I carried on down the path towards where the Fallow deer were grazing. Two young stags were having a bit of wrestle with their antlers while an older and much larger Red stag walked nonchalantly past. Having taken plenty of deer photos I walked up to the drive of Studley Royal House before cutting back across the park to the main drive. It had been a very cold, frosty night followed by a bright sunny winter’s morning which made the landscape even more interesting than usual. Where the sun could penetrate the frost quickly melted, in the shade though there was a veneer of white that remained throughout the walk. At the gatehouse I caught up with Lisa and Rhiannon before we all continued together up Plumpton Lane, passing Plumpton Hall. Across the fields to our left we could see Ripon Cathedral. At the top of the lane the path then dropped down into Chinese Wood before encountering the first of the seven bridges we had to cross to get back to the lake. This really is an utterly delightful section as the River Skell meanders through a short, steep-sided valley. Particularly charming are the central set of five old packhorse bridges. High above the middle two bridges, which are only metres apart, is the folly known as the Devil’s Chimney. At the seventh bridge we crossed over a waterfall, the outflow from the lake before continuing on a path around the lake shore. Upon reaching the Studley Royal car park we took a steep little path back up towards the church before returning to the visitor centre along the lane which is also known as Church Walk. A pleasant stroll to end what had been a lovely little outing. Lovely write up and photos, Matt 🙂 Fountains Abbey / Studley Royal is one of my favourite places for a walk, even though there isn’t a mountain in sight! Cheers Neil! Yes, it is beautiful round there and you can see why it was included in the Nidderdale AONB.